We often joke in this country about Obsessive Compulsive Disorder, and all the things that come with it. 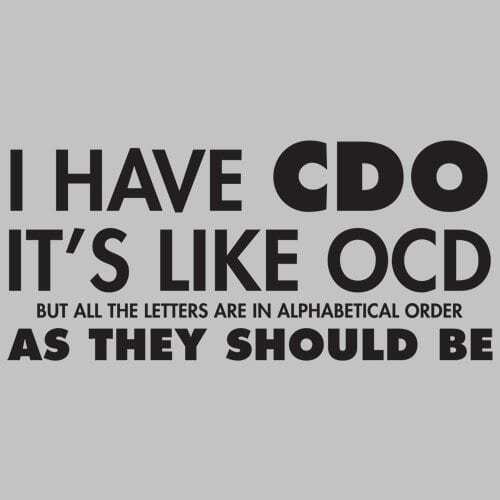 I’ve even heard the joke, and repeated it, that it should be CDO, so the letters are in the proper order, as they should be. But to those who suffer from it, and many other disorders, it’s often no joke. In fact, it often deeply affects our lives. So what is OCD really? It’s defined as an anxiety disorder and “is characterized by recurrent, sometimes unwanted thoughts (obsessions) and/or repetitive behaviors (compulsions). Repetitive behaviors such as hand-washing, counting or cleaning are often performed with the hope of preventing obsessive thoughts or making them go away. Performing these so-called ‘rituals,’ however, provides only temporary relief, and not performing them markedly increases anxiety.” (https://bbrfoundation.org/ocd) The disease is extremely common in the United States. Note those numbers. That means 40-60% still suffer, even with medication, and even those who do respond are certainly not cured. Their symptoms are simply reduced. 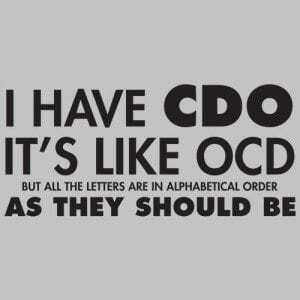 So what does OCD look like in real life? It isn’t always destructive. I’ll share with you here. Obsession: My obsession is creative work. When I was younger, I thought it was just work in general, but that isn’t true. Before becoming a writer and editor, I had a large collection of hairnets, nametags, and failed careers. A part of the issue was that while I was obsessed with work, I was choosing the wrong line of work. As a result, I either became disgruntled or bored, and in either case, my exit followed shortly. Compulsion: So what are my unwanted or repetitive behaviors that recur? Well, there are a few, but they almost all involve two things: control and order. They are odd, because I am not like the popular TV detective Monk: they don’t include every aspect of my life, just large portions. If you don’t live with me, or spend significant time with me, you aren’t likely to see them. How they actually affect me is another matter. There are times when they are paralyzing, quite literally, or at others the compulsion to clean or create order in some area overrides everything else, and regardless of how important the other things I should be doing are, I will abandon them until the “problem” I have “discovered” is corrected. Disorder? Not everyone with Obsessive Compulsive tendencies can be diagnosed with a disorder, a specific term referring to when the obsessions and compulsions interfere with one’s ADL’s (Activities of Daily Living). There are six: eating, bathing, dressing, toileting, transferring (walking) and continence. The severity of a disorder can also be determined by how much obsessions and compulsions interfere with the above. Many who find their symptoms mild enough never seek treatment at all, unless the condition worsens, and just determine it is something they should just live with. So should you get tested and determine if you need treatment? 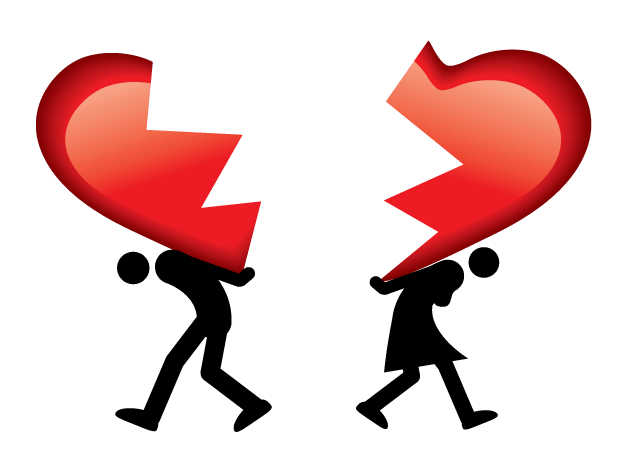 Are your compulsions destructive, and causing harm to you or those around you, or could they? One of the easiest ways to determine this is to ask those who live with you, and work closely with you. 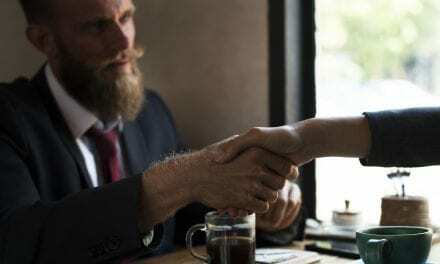 They may be able to more objectively answer your questions. Either way, treated or untreated, diagnosed or not, living with OCD is not easy, even for those around us. We can kid about it, and I won’t stop you if you make OCD jokes. I might even join in. Just keep in mind that for many, it isn’t funny at all.